Other than perhaps diamonds, no adornment is as beautiful and captivating as pure gold jewelry. Both 22K and 24K gold jewelry are alluring, elegant and magnify the beauty of the wearer. It’s why humans have crafted jewelry from gold for thousands of years. Its innate beauty conjures up feelings of beauty, power and wealth. It is no stretch to say that one can never go wrong buying a beautiful piece of gold jewelry. It is timeless. Many gold jewels have been passed down as family heirlooms. And while you are probably buying them for their beauty, they also have value as money in times of crisis. However, there are good and bad ways to buy gold jewelry. For example, many people mistake fashion jewelry for actual gold jewelry. But while fashion jewelry often mimics the look of gold, it doesn't have the heft of real gold. That lack of heft means it’s probably costume jewelry. Real gold jewelry, on the other hand, stands the test of time in the world of fashion. 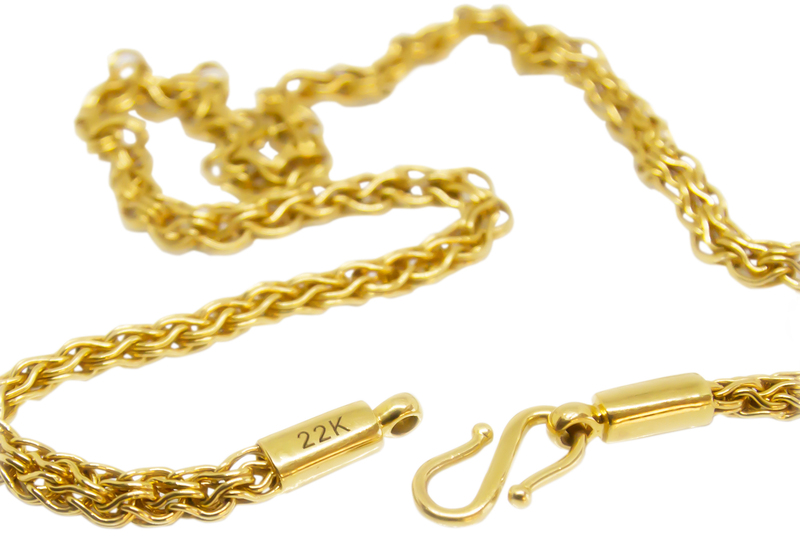 What’s the difference between 22K and 24K gold jewelry? What are 18K, 14K and 12K gold? Should I buy 22K or 24K gold jewelry? When is pure gold jewelry an appropriate gift? Why else should you buy gold jewelry? Where can I buy solid gold jewelry? 1. What’s the Difference Between 22K and 24K Gold? Karat is symbolized as K or Kt and will be preceded by a purity rating of 10, 12, 14, 18, 22 or 24. In most advanced countries, jewelers are required by law to stamp their gold jewelry with its karat rating. So what is 24K gold? Simply put, the higher the karat, the purer the gold. 24K signifies 99.9 percent purity, the highest you can buy. 24K gold is bright yellow, and its beauty and shine are unmistakable. Gold jewelry stamped 22K is approximately 91 percent pure gold, with the other 9 percent usually consisting of copper, silver or other metals. 2. What Is 18K, 14K and 12K Gold? Since 24K is pure gold, don’t let a dealer try to sell you 25K or 26K gold! 3. Should I Buy 22K or 24K Gold Jewelry? Most “gold” jewelry sold today is 14 karat, meaning only about 58 percent of it is gold. To get the most gold for your money, look for 22K or 24K. First, a little about this metal. Gold is heavy and it doesn’t tarnish, but it is softer than most other metals. The advantage of this softness is that it makes gold malleable (easy to shape and mold into tiny pieces). Silver jewelry, on the other hand, does tarnish, so it needs more care. While 24K gold is brilliant in color, it is also warmer-toned than most other jewelry, making it more inviting. And because it contains more gold, 24K jewelry is slightly more valuable than jewelry of the same weight but lesser purity. 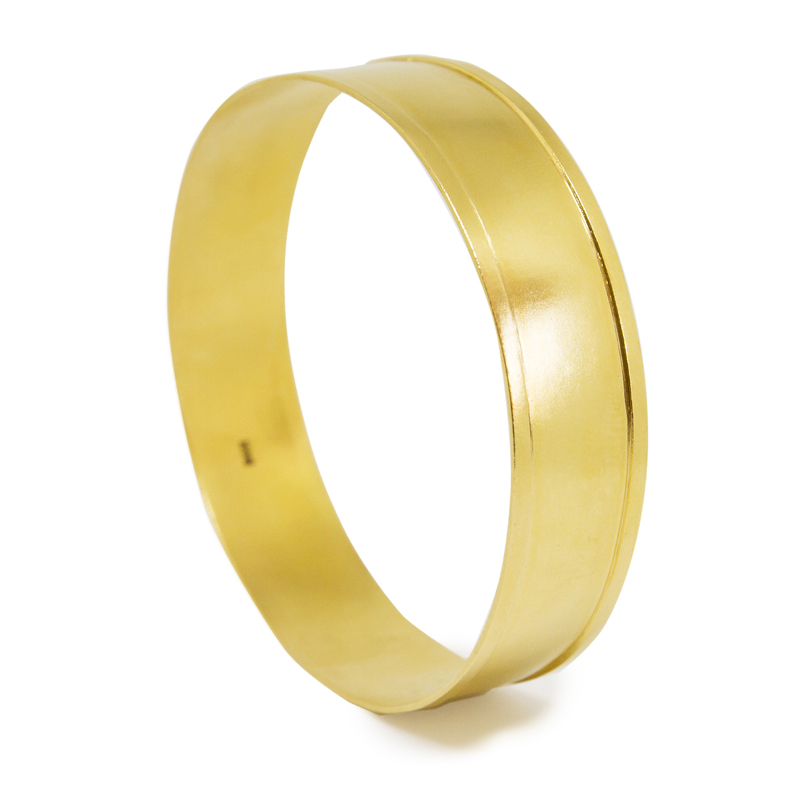 The disadvantage of 24K gold jewelry is that it can break and is scratched easily. Also, since 24K is pure gold, it is usually a tad more expensive than 22K or 18K. 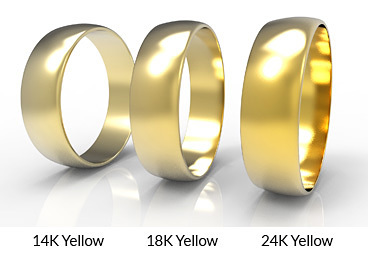 22K jewelry is a little more durable than 24K since it is mixed with harder metals like copper or silver. 18K and 14K contain even more base metals and are thus even more durable. But since they contain less gold, a discerning eye can pick up the difference. So this is the primary reason you’ll find more 22K gold jewelry for sale then 24K: it is stronger and more durable. By the way, the terms yellow, rose, and white gold correspond roughly to the amount of gold content and the type of the other metal that is alloyed (blended) with the gold to make it stronger. The redder the gold, the higher the copper content. The whiter the gold, the higher the silver content. 22K or 24K is yellow gold. Some people prefer the luster of pure 24K gold, while others may want the greater durability and lower cost of the lower karats. Either way, you’ll want to handle your gold jewelry with care. If you can’t try the piece on in a store, here are a few guidelines to select the right size. If you’re buying it as a gift, this info can help you identify what might look best on your recipient. 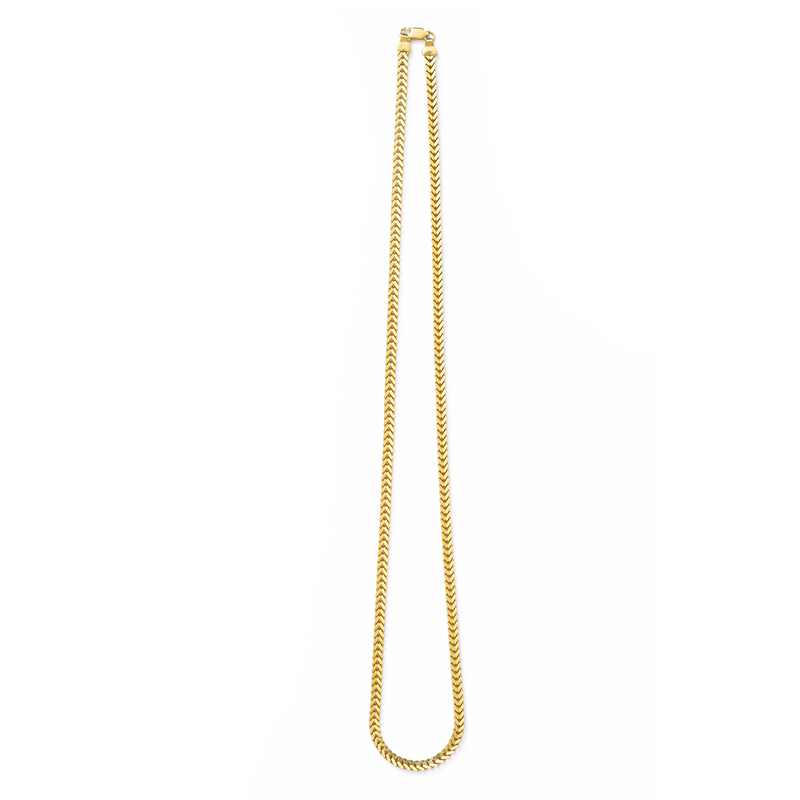 Necklaces for women: These can range anywhere from 10 to 48 inches. Most women’s necklaces are sold in even-inch lengths. Be aware the clasp or connector that holds the necklace together is typically not included in necklace size measurements. A standard clasp is ¾-inch long. Some may be longer, so take this into account when considering the length. Necklaces for men: These typically range from 18 to 24 inches and are also usually manufactured in even-inch lengths. Bracelets for women: The standard size for a women’s bracelet is 7-7½ inches. The bracelet will hang between the hand and wrist bone, which fashion experts say is the most attractive position. For necklaces, use a soft flexible tape measure and wrap closely around your neck. The tape should be snug but not suffocating. If you want a collar or choker, add two inches to your neck measurement (which is considered one size for necklaces). For bracelets, measure at the broadest part of the wrist (just below the wrist bone), then add about a half inch. This is your approximate bracelet size. If you add more the bracelet will hang lower on the hand; if you add less it’ll be tighter. If you don’t have a flexible tape measure for a necklace, cut pieces of string in four sizes: 8", 10", 12" and 14". Then try each one on and decide which length is preferred. Keep in mind that multiple lengths can fit one person; different lengths provide a different fashion effect. 6. When Is Pure Gold Jewelry an Appropriate Gift? • Apology or "get out of the doghouse"
The reason gold jewelry can be an ideal gift is that it can be handed down from generation to generation. Remember, gold lasts forever; it doesn't corrode, tarnish, melt, or rust. It has no time limit. It’ll still be beautiful when your great-grandchildren wear it. Consider that the gold jewelry worn by the women and men of Ancient Greece, Rome and Egypt are still beautiful pieces today! 7. Why Else Should You Buy Gold Jewelry? Bullion Jewelry™ is simply gold jewelry that is comprised solely of gold and has no other gems or frills. 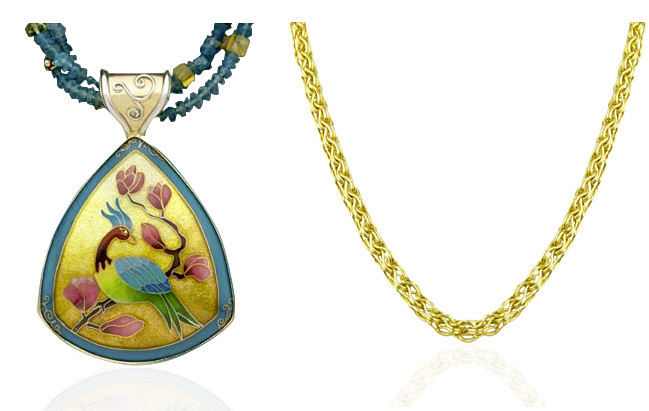 As you probably know, most jewelry pieces today contains other metals, gems or artsy components. The difference can be striking. The advantage of investment-grade or bullion jewelryTM is that it will rise in value commensurate with the price of gold. Since most modern jewelry contains other decorative items, it will not necessarily appreciate with the gold price. Gold bullion jewelry, on the other hand, will appreciate over time. It will grow in value, since it is more closely tied to the price of gold. Most jewelry today cannot be sold back at its original cost. With a beautiful piece of gold bullion jewelry, you have not just an alluring adornment that can be enjoyed, but an asset that will become more valuable over time. This type of jewelry is truly an investment. It can be a portable store of wealth. It can make traveling and transporting some of your assets simpler and easier, and it can always be accessed in times of need. It makes giving wealth to your heirs or as a gift more straightforward — even if they don’t understand the value of gold today. Gold bullion jewelry comes with much lower premiums than most fashion gold jewelry. It is subject to less tax and reporting complexity. Gold jewelry is an asset you can keep outside of the banking system. It could even help you avoid a future gold confiscation. And since it is gold, it can be an insurance policy in the event you need money down the road. It can be sold much more easily and at a better price than costume jewelry. The catch is, most gold jewelry doesn’t qualify as investment grade. Those stores in the mall sell mostly 14-karat gold—and at premiums two, three and four times the melt value of the gold content. Designer jewelry simply is not a practical or efficient way to store wealth; Tiffany’s won’t buy back your gold necklace at anywhere near what you paid for it. Investment-grade jewelry, on the other hand, is specifically designed for wearing your wealth, at a reasonable markup, that markup, which should appreciate over time. It’s hard to pass up that advantage. 8. Where Can I Buy Solid Gold Jewelry? Consider the timeless beauty and prosperity that gold bullion jewelry can offer. See our full line of gold pieces here.